Over 30 years of technology forecasting experience has made TFI one of the world's premier providers of quality technology forecasts. To prosper in the rapid pace of change in today's business environment, you must be able to project future developments in an organized, responsible, and timely manner. We actively use a large number of different techniques that allow us to customize forecasting projects to your specific needs and preferences. These techniques include both analytical and expert-opinion methods. Identify and evaluate new technology-based products and services. Define market needs for new technologies. Project market adoption rates for new technologies. 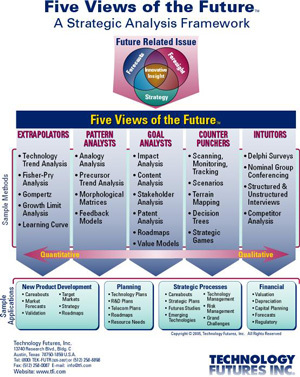 Formulate strategic models of future developments. Estimate economic lives and depreciation schedules for technology investments. Develop cash flow models for technology investments. Unless you want a completely independent TFI forecast, we work closely with you to integrate your subject matter expertise with our forecasting capability. This ensures the forecast's relevance, validity, and acceptance and provides you and your organization with practical forecasting experience. 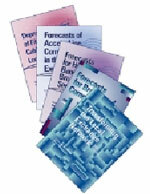 Beside developing specific forecasts, we can also help you develop your own forecasting program or independently evaluate other forecasts. Samsung, NSA, Boeing, Texas State Technical College Systems, and AT&T are among the many clients who have utilized TFI Technology Forecasting services. If you believe TFI can be of assistance to you in the Technology Forecasting area, please contact TFI at (512) 258-8898 or info@tfi.com. We welcome your inquiries. Copyright © Technology Futures, Inc. All rights reserved.